The Coopers Pond Neighborhood is located on the northwest side of Columbia, South Carolina in the town of Blythewood. This is a beautiful little town, with the center being northeast of the Blythewood Road exit off of I-77. The Coppers Pond community is just off of this exit as well, placing residents just 15 minutes from the downtown Columbia, SC area. Keep heading south on I-77, and end at I-26, placing residents on the path to Charleston, SC or head west and find yourself in Greenville or Spartanburg, SC or even Asheville, North Carolina. Head north on I-77, and be in Charlotte, NC in little more than an hour. I-77 also intersects with I-20, providing easy access to Myrtle Beach, SC to the east and Atlanta, Georgia to the west. No matter where in the State or in the Southeast you wish to go, the Coopers Pond Neighborhood near Columbia, SC puts you close to anywhere you want to be. The Coopers Pond Neighborhood, SC is a recently established neighborhood of homes near the wonderful, quaint town of Blythewood. The homes in this nice community range in value from around $161,000.00 to over $240,000.00. These homes vary in size from as little as 2100 square feet to over 3500 square feet. Due to the variety of homes here, there are a number of wonderful amenities to include homes with a pond view, large lot, porches, a balcony, bay windows, tankless water heaters, surround sound systems, and even some with a central vacuum system. No matter what you might be looking for in a new home, Coopers Pond Neighborhood has something for just about anyone to choose from. Living in the Coopers Pond Neighborhood puts residents close to many work and hobby related activities. With the town of Blythewood just minutes away, residents have access to a variety of local restaurants, stores, and seasonal entertainment. The town is also working toward the establishment of a multipurpose park to encourage a number of outdoor activities including baseball, soccer, hiking, and even development of a skating park. A few miles up I-77 and pick up Hwy. 277 toward Columbia, SC placing residents in the downtown area in 15 minutes. 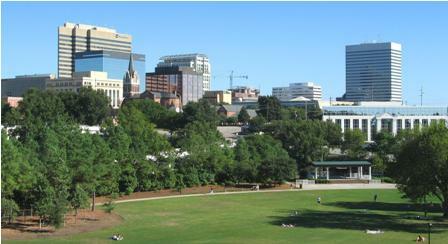 Downtown Columbia, SC boasts a number and variety of restaurants, as well as places to shop. There are also a number of museums, theatres, and collegiate activities to engage in, as well as the nationally renowned Riverbanks Zoo and Botanical Gardens to visit. Just 30 minutes away from Coopers Pond is Lake Wateree, with options for a number of water sports activities, as well as hiking, biking, and camping options at the Wateree Lake State Park. No matter what you enjoying doing, living in the Coopers Pond Neighborhood puts you on the right track to just about anything you enjoy. Our Local Realtors and Network of Colleagues offer the best Internet Marketing Visibility for your Listed Properties - Exit Real Estate Consultants is your local expert in all your Real Estate needs in Columbia South Carolina. You have access to the most comprehensive MLS Listing Service with free access and advanced tools for Real Estate Buyers and Sellers - put us to work for you; our service will impress you! (803) 358-0888.